Today is a big day, not just for any average smartphone lover, but for the 90s’ kids who have always been amused by phone from one single brand- Nokia. As Nokia returned to phone business, they have already launched a few new feature phones, smartphones including the Nokia 3, 5 and 6. And now, Nokia 8, the flagship from Nokia is finally official. There are some exciting things and features that Nokia 8 packs, and we can’t wait to share the excitement with everyone, especially the Nokia fanboys. Nokia 8 has a Snapdragon 835 processor, 4GB of RAM, 64GB of expandable storage, and a 5.3″ 2048×1080 Gorilla Glass 5 display. The design isn’t something out-of-the-universe- no bezel-less display or Iris scanners, but you get many other things that may turn out to be good or even something unique, which may lead to a new trend- That’s what Nokia is hoping with ‘Bothie.’ Surprised a bit? Well, bothie is basically what they call a footage that has been recorded simultaneously with the front and rear cameras at the same time. This is something new, but you might not be able to get the best kind of bothies all the time. The Nokia 8 also comes with Nokia OZO spatial 360° audio which provides a perfect audio something like HRTF effect that you might find in a game (Sorry for that explanation as I can relate to it in Counter Strike). A primary example of HRTF- A head-related transfer function (HRTF) is a response that characterizes how an ear receives a sound from a point in space. It means, when you are moving with your phone or any other object is moving or changing orientation, you can feel the difference just like you do in real life, like a sports car passing by or a train, when it enters and leave the platform, and you can just experience the whole surroundings with the help of sound. The Nokia OZO 360° audio will work great with headphones on, and users will surely enjoy this as Nokia claims. Nokia has also shown off the OZO spatial 360° audio with the help of a comparison video. You may watch this to understand a bit about its practical use. Now we already talked a bit about bothies, and to capture them there are three cameras on board. 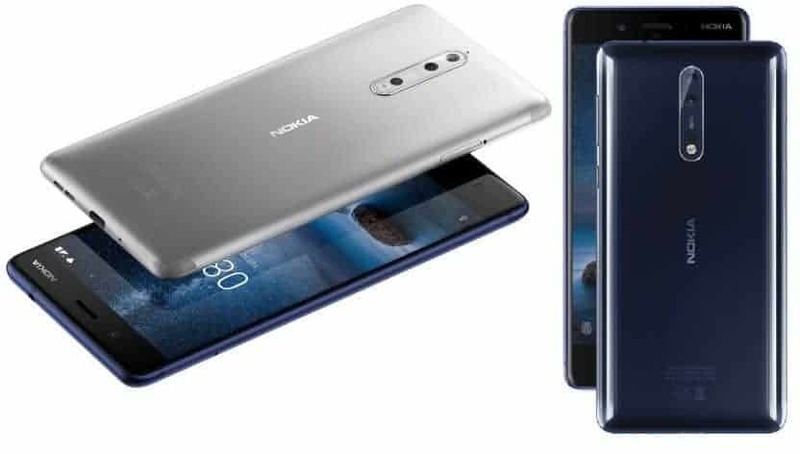 The Nokia 8 has 13MP dual back cameras, as well as a 13MP phase detection autofocus front camera with f/2.0 optics from ZEISS, something which we have seen on Nokia phones like the Nokia 808 and Lumia 1020. The Nokia 8 will come with Android 7.1.1 Nougat, and it is near stock Android with nearly no customizations of bloatware. Also, with the Nokia 8 users will get unlimited Google Photos Storage and Google Assistant on tap. The Nokia 8 is priced at €599 in Europe and will go on sale soon, so we can expect the phone to be priced at around Rs. 40,000 in India, if Nokia decides to keep the price tag a bit lower as the audience, fans and its brand value are enormous in the country. Previous articleLauco – NanoSuction Car Mount Review – Works Like a Charm! What’s stopping Asus & Huawei from reaching the top position in Indian Smartphone Market?